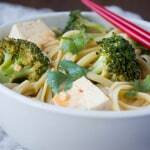 Easy Curried Noodles with Tofu and a Giveaway! An simple weeknight dinner with less than 10 ingredients that can be made in under 30 minutes. 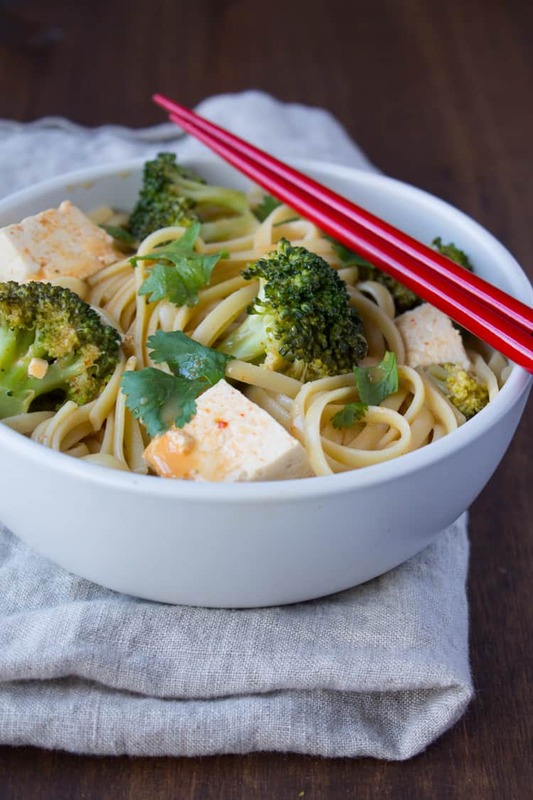 Easy curried noodles with tofu and broccoli packs in Thai flavor and is cheaper and healthier than Thai take-out! 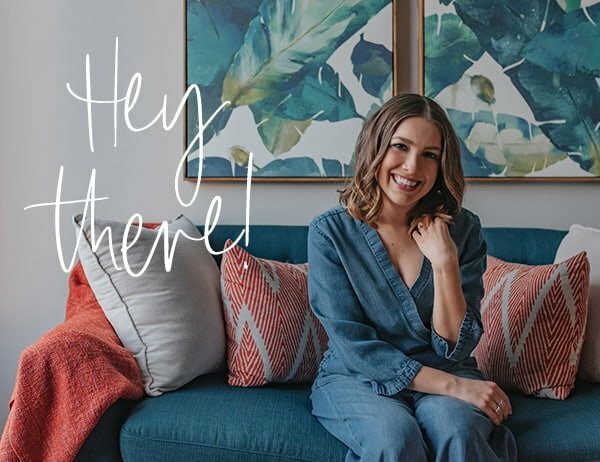 Read on for details on my exciting giveaway! Everyone has their go-to take-out place, right? Mine is Thai. Which is surprising to say considering I thought my trip to Thailand would forever ruin American Thai take-out for me. And it did. For a while. Until we moved and this awesome authentic Thai/Vietnamese restaurant opened up and when my first dish there cleared out my sinuses and set my mouth on fire, I knew we had a found a good thing. But take-out is kind of silly. I mean, I love going out to eat for the experience of going out to eat. Going out to eat minus the “going out” part just feels lame. And we all do it because it’s easy, right? But what if we had easy, “take-out inspired” meals we could make at home in less than 30 minutes. I mean it takes at least 30 minutes from the time you pick up the phone to the time you walk back in the door with food, right? That was my inspiration for this dish – keep. it. simple. The simpler and easier we keep eating healthy, the more likely we are to do it! That’s why I was thrilled when Dreamfields reached out to me and told me their focus this year was about all the little things people can do differently to live a little healthier, You know, the little things that add up over time. The simple swaps and small tweaks to your daily life that make changing habits seem less daunting. Like swapping out regular pasta for one that has more fiber and protein! Did you know that one cup of cooked Dreamfields pasta has 5 grams of fiber and 7 grams of protein? 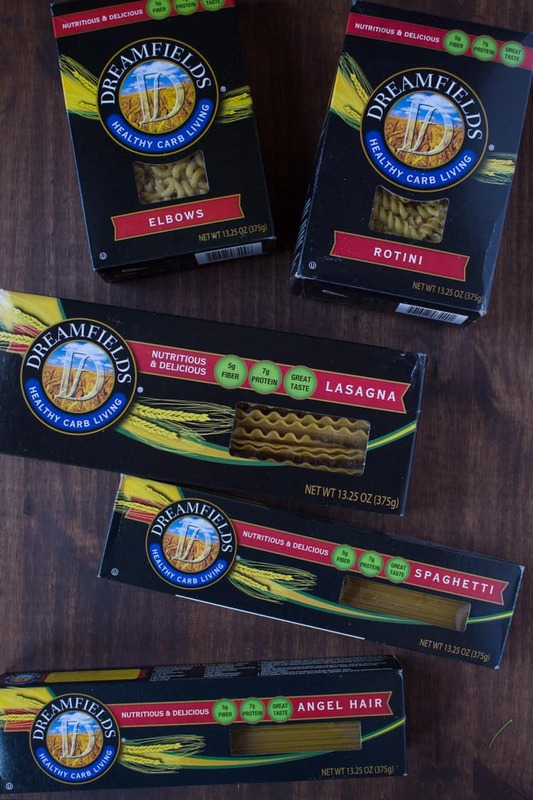 Dreamfields is made with premium durum wheat semolina from North Dakota, which is why it has the same delicious taste and texture of traditional pasta. One of my favorite tips for healthy eating and overall mindfulness is eating with chopsticks! Seriously. How easy is it to pick up chopsticks instead of your fork – such a small, simple change! But it’s not so easy to eat with chopsticks and that’s really the point. Using a utensil you’re not very comfortable with will force you to slow down your eating. And because it’s kind of awkward, it’s going to encourage you to focus on the food in front of you and the act of eating in general. Otherwise, you’re going to end up with a pile o’ noodles on the floor. And you can use chopsticks with any meal, not just pasta. 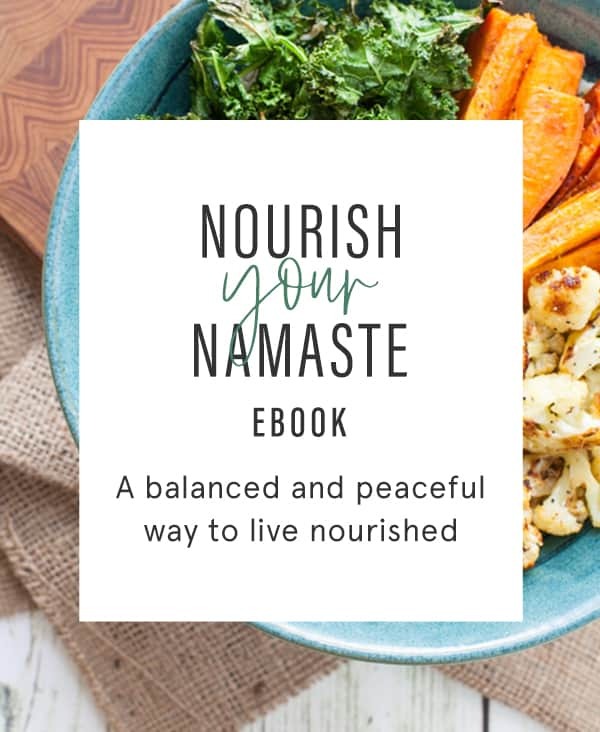 And if mindful eating is new to you, read my post Are You Really Eating Mindfully? 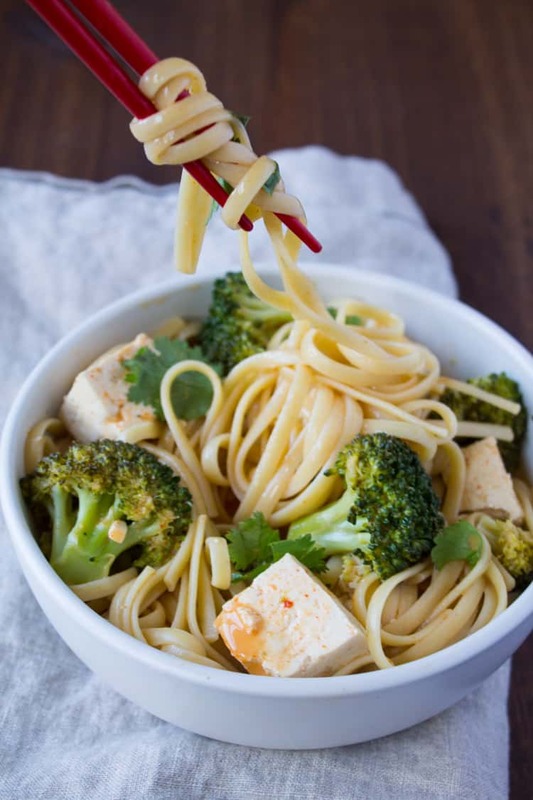 Try your hand at chopsticks with this pasta dish and feel good about what you’re eating! Even though this dish is simple to make, it doesn’t hold back on flavor. I’m excited to have a new go-to weeknight meal in my repertoire! Meanwhile, heat canola oil in a large sauté pan over medium heat. Add broccoli; toss to coat. Add ¼ cup water; cover and cook for 5 minutes or until broccoli is crisp-tender. Add garlic; cook for an additional 2 minutes. Season with salt. Add tofu, coconut milk, curry paste, soy sauce, lime juice, and fish sauce to the sauté pan. Stir ingredients together. Bring sauce just to boil; reduce heat and let simmer for 10 minutes. Remove from heat. 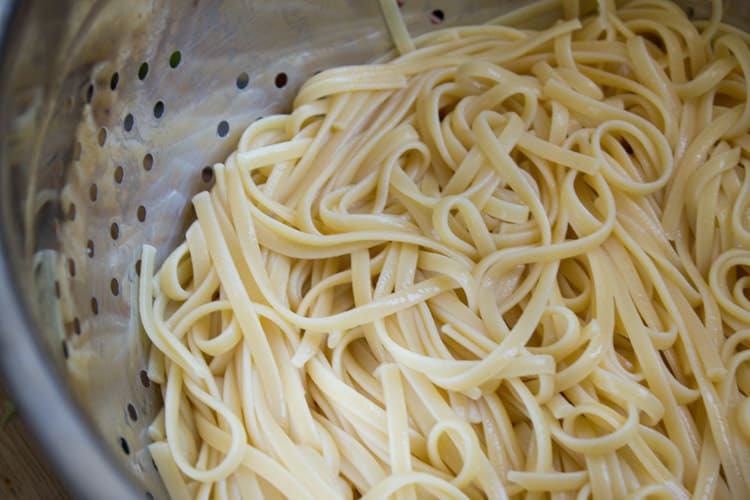 Add pasta to sauté pan; toss to coat well. Optional: garnish with cilantro upon serving. 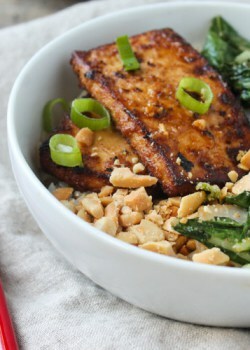 *Fish sauce can be omitted to make this dish vegetarian/vegan. Nutrition information (1/8 of recipe): 280 calories; 12 g protein; 42 g carbohydrates; 8 g total fat; 2 g saturated fat; 0 mg cholesterol; 760 mg sodium; 6 g total dietary fiber. And now for the GIVEAWAY! Dreamfields is giving away a Dreamfields family pack (that’s 7 boxes of different types of pasta!) PLUS a food scale to one lucky reader of TFD! The contest will run through April 24th and I’ll announce the winner the following week. Enter below! I love how fast and simple this is- definitely adding this to my recipe to-make list! I definitely need to make some healthy changes in my life and starting tomorrow I’m going to walk/move more. Walking and moving more is a great goal! I could out the junk food. So important to stay hydrated! One simple change I want to make is to drink a glass of water when I get up in the morning. Not only does it fill your stomach so you eat less, but it is a reminder to myself to make healthier choices during the day. Great one, Katrina! I start every day with a cup of warm water with lemon. I agree–using chopsticks can really slow you down and make you savor a meal! Love the eat more veggies goal, Fern! Such a simple change that goes such a long way! The healthiest thing would be if I could convince Mark to NOT smoke in the house. Second hand smoke – yuck! I could eat more veggies!! Yes, bring on the veggies! As a family we really try to limit eating at restaurants as much as possible. Not only is it a healthier option but we save so much money by cooking at home. And cooking at home brings the family together too! I just added you to pinterest and instagram. As a woman, I know I need to add weights to improve bone strength! Yes! Strength training is a great way to help prevent osteoporosis! I can drink more water, skipping the diet soda, and exercise regularly. I am working on cutting back on my caffeine intake and drinking more water. Love this, Sandy! So important to stay hydrated! I could do more exercise! Take the stairs instead of elevators or escalators if you are able. Such an easy change that goes a long way! Such a good one, Marie! Try to eat fruit and veggies throughout the day. Haha, eating with chopsticks is no issue for me at all! I’m Chinese and chopsticks were the first utensils I ever ate with. I also love cooking with them! 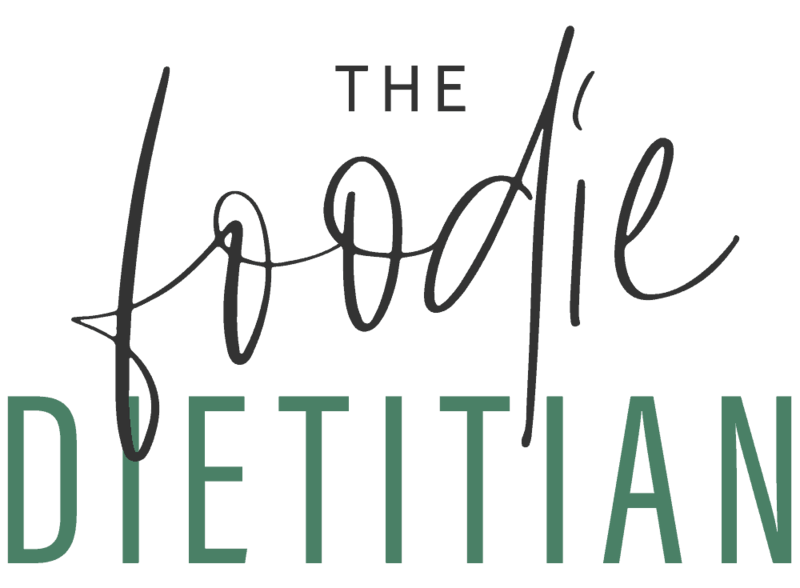 I totally agree that slowing down your eating is a much healthier and more mindful way of eating- I chew all my food thoroughly before I swallow as a way of slowing myself down, which also helps with digestion. I’ve been taking homemade snacks and lunches to work so I feel less inclined to spend money on unhealthy munchies and also going to work with my yoga mat so I have no excuse to skip yoga before or after work. These noodles sound so yummy- so hard not to love Thai food!! Wow, those are some seriously awesome healthy habits you’ve got going on there, Genevieve. And I love how simple yet powerful they are! 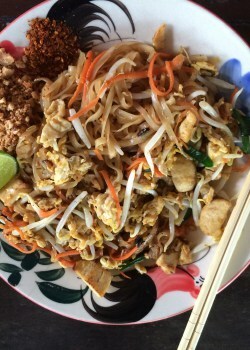 I love Thai food also and have on occasion made my own version of pad Thai or a curry at home. Using chopsticks is so much fun and definitely a great way to slow down your eating – it really makes a difference. Look forward to trying this recipe! Thanks, Jessica! Thai food is one of my favorite cuisines too. One change I made that I am trying to get our entire household to adopt is to give up soda and drink water instead. Such a powerful habit change, David! I can take the stairs instead of the elevator at work! Love using chopsticks for this purpose 🙂 Thai has become one of my favorite comfort go-to meals for sure. I mean, how can you not?? YUM. Sleep! Yes – SO important. Thanks for sharing a new product- will definitely check them out! And this recipe sounds simple and delicious FTW! So glad to know there’s a pasta that’s healthy! Hoping I win this. Great day to everyone! I really love it. Enjoy, Deanna! I have been using Dreamfield pastas for about 5 years now. I love their pastas. Me too, Lori! Love them. Gr8 go to meal, Kara. Thanks for introducing me to Dreamfields pasta. I can always carry healthy snacks with me (to school, work, etc) to make sure I never go hungry without access to healthy food. I can ride by bike more often instead of driving! Yes! What a great change, Anna!